It's time for back to school and we as parents want our children to be doing great in their school adventure. One of the most important part of going to school, is to ensure our children have the right fuel to get through the day and not be distracted by a hungry stomach. 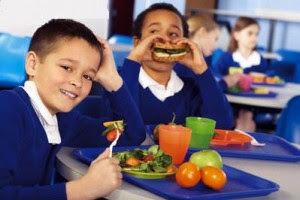 The type of food your child eats can affect their overall behavior and worse of all affect their academic performance! Children need healthy meals to perform at their best. Of course they also need the right amount of sleep too! Parents should take the time to read the labels and avoid certain additives and chemicals found in certain foods. Some of these includes: MSG, hydrogenated fats and oils, Artificial sweeteners and high fructose corn syrup and others. I am very conscious about ensuring that my children eat healthy. Especially my son because he attends school and I am the one who prepares his breakfasts and lunches and dinner! As a parent I try to ensure he eats lots of vegetables and fruits and whole grains. I also prefer not to purchase meats that are processed or any other process food if I can help it. I love being able to prepare his meals and ensure that he is eating healthy and that he also has a full stomach and not get distracted by rumbling tummy during school. If you cannot make your child's lunch, many schools have programs in place to help you out and it seems schools are moving toward healthier meals. So seek out more information on your child's school meal program and see if it is something that will work for you and your child. Check out the blog www.jamericanspice.com for more great information and giveaways for back to school! Thanks Colette for an awesome and informative post! I could sure use the tip on the lunches. I am always stuck for ideas. Great info! We are a health-nut family, but I can't control what my kids eat at school. And I hate that they don't give enough time! I have a super slow eater. Ugh - gearing up for another year! Coming from Welcome Wednesday. Thank you for featuring me! I'm honored and excited! Wonderful post, Colette, and I agree with you whole-heartedly. I think a nutritious lunch is critical for their little brains to keep performing well. Those are delicious ideas and great brain food! Those lunch ideas might spark some interest from my "no thank you to the sandwich" daughter! And I fully agree that sleep is soooo important! It certainly did get harder last year when the boy had to be ready for the bus by 6:50! (messes with my sleep too!) 2 more weeks until we go back. Hello! I am your newest follower from the Welcome Wednesday Blog Hop. Please follow me back and feel free to drop by anytime! Great Post! healthy and fun lunches for kids is always the best. Thanks for the tips! You are absolutely right - we are what we eat. I love your meal suggestions for children. Following from Hopalong Friday! That is a great article Colette. You really hit on some good points and I really like those meal suggestions.